I am buying a new Fortress stern anchor. we will be here often bow to catch the rock and the anchor is dropped on the stern. old boat fly bridge cruiser 38 "about 9000kg 10kg bruce work well with copy and 12mm lead-core rope. Fortress intended to replace the anchor which size would be proven in practice? I think if it were shown FX16 4.6 kg 10-12m boats, but it affects so light, I dot know? I use a FX 23 on my rather light 38'. It has worked well in thousands of anchorings, mostly sand or mud bottom. They also recommended a FX 16 for me, I wanted to upsize a little. Still very easy to handle. Has about 10-12' of 3/8" chain. It is secured in a clip on the foredeck with lock screw/hand wheel. No windlass. NBS, did you check the chart on the Fortress website? FWIW, we bought our first Fortress to use as back-up, kedge, and stern if necessary (although we've never needed to use a stern anchor yet). Because of all those missions, I upsized one step from the Fortress chart. We carry ours dismantled, in the Fortress storage bag. That's partly because it stows so well that way, and partly because the fluke angle selection is generally dependent on wherever the current location is, and the bottom type there. A 37 for a 37. There you go. For my NT 42 I used the 37 on the bow and the 23 for the stern. I would suggest that in the situations depicted in the photo that you consider dropping an anchor off your bow, and then back down on that anchor towards the shore. Then take a line from your stern to tie on shore. Why use an anchor that may not hold as well, in a location where you don't have a windlass, when you can just use your bow anchor? Krogen Manatee 25000 lbs, I use FX37 on the bow and FX23 stern. Rail bracket storage for both. The only time I used a stern anchor was because of the current in the Alabama River on the Tenn Tom when we anchored for the night due to lack of a marina. Two words come to mind when thinking about going ashore...Deliverance and Snakes. I don't blame you. However, North Baltic's situation is different. The photo shows shore ties very similar to what is done a lot up in BC in different locations. I am surprised they do a bow tie instead of a stern tie however. Unless they nose in to the bank and have someone jump ashore over the bow to take the bow line to shore, it seems easier to use their existing anchor. Looking at the photo again, I don't see any dinghies. Without a dinghy a stern tie may be tough so they just might go over the bow to get ashore. Thanks for the responses and pictures, they are helpful to think of a new anchor. a few comments on what's debate. Several ports so narrow nature can not be anchored to the bow and spinning around, as a number of other arrives at the port. we do not have to tide, because the people here rather want to stick to this, as a commercial port. There are no predators here like a bear, only one little poisonous snake. 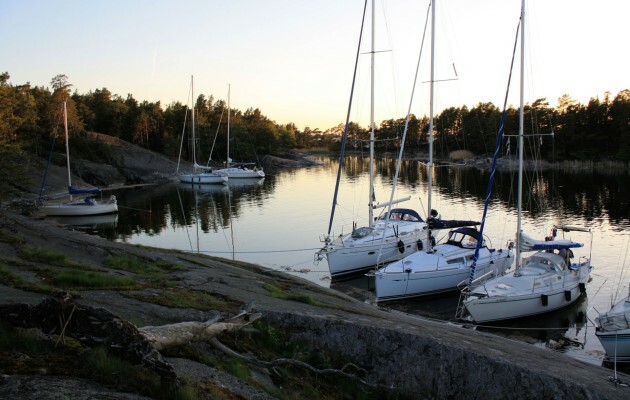 in this video where you can see a little, how do we do stern anchoring bow to the beach. Fx23 for every day anchor. Fx37 for bad weather anchor. It's just one photo and I've never been in a situation like that but I'm guessing they go bow in to avoid possible damage to the running gear. Also very common on boating beaches (usually sandbars just inside inlets) here on the East Coast. Used to do it a lot with my center console. Also have towed dozens that were sanded when they let the tide get too far out. Outboards and stern drives will raise their engines and stern in for the swim ladder ....or not if a bowrider style with bow ladder. There are several manufactures of stake anchors for using on the beach rather than a conventional anchor. Yes, that's why. Beaches are often shallow water can not take stern first, if not the boat "gang way". the second anchor does not prevent the boat from moving sideways and rock seldom a direct danger fender slips away and will damage the body, the bow does not matter if the boat is moving sideways to get to the anchor. we bows open and equipped with a ladder, see fig. here is also often used to attach the dock bow first for the same reason, or forbidden, or the long side of the pier so high that difficult to pass a swim platform see fig.